We all get older eventually — and that goes for cats, too. The aging process varies slightly, and cats do tend to live longer today than in the past. Despite this, there is still a wide range in terms of life expectancy in cats, depending on their breed and whether they are indoor or outdoor cats. Just as some humans start to lose their hearing as they age, the same is true of cats. This will not happen in every case, but it is fairly common. It can also vary greatly in terms of severity, sometimes not being noticeable in some cases while other cats will become completely deaf. If you think your cat is starting to lose her hearing because of old age, check with your veterinarian to rule out any other possible causes. In addition to changes in hearing, some cats will also have changes in their eyes — although this is frequently not related to vision. Some cats (especially those with lighter-colored coats) may experience their eyes beginning to appear “moth-eaten” when they get older. This will not affect vision but can cause light sensitivity. Another possible change is that the eyes may become cloudy near the pupils. 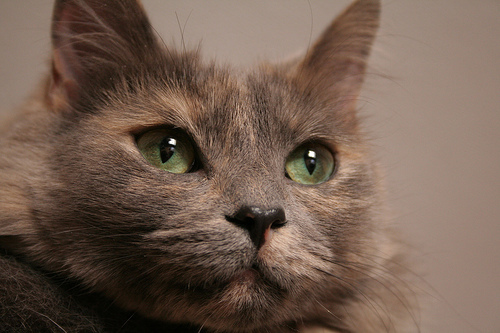 Cloudy eyes do not affect vision; they are simply a normal part of the aging process for cats. It is important to distinguish this normal cloudiness (which is blue) from cataracts (which are opaque and white), because cataracts can be serious. Just like many other animals (including humans), most cats will have some graying of their fur as they start to get older. As with all other signs of feline aging, the extent of this can vary greatly. In most cases this graying will occur on the muzzle area as well as throughout the fur. It can also happen near the eyebrows and nose. This is normal and shouldn’t be cause for alarm. It is common to notice an older cat eating less or more slowly than he used to when he was younger. 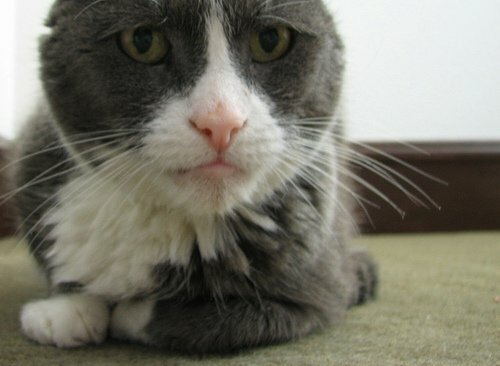 Part of the problem is that the digestive system moves more slowly in older cats, and this means constipation can occasionally become a problem. In addition to slowing down, digestion becomes harder, especially of fat — and because of this, older cats tend to lose weight. A lot of time, switching a cat’s diet from large meals to more frequent smaller meals can help reduce the weight loss. If your cat is constipated for more than a day or is losing a great deal of weight, you should always take her to the vet. If you have an older cat who is beginning to have problems moving around, this is another sign of feline aging. He may start walking more stiffly or appear to avoid jumping and climbing. This can indicate muscular problems or arthritis, both of which can be problematic in aging felines. If your cat is having problems moving, don’t hesitate to take him to the vet, who can offer suggestions to alleviate the pain. Elderly cats tend to sleep a lot more and play less. They may react poorly to stress, so it is best to not introduce them to new situations once they get older. Some cats may become aggressive because of fear or pain. In many cases, your veterinarian will be able to determine the cause of the aggression and either eliminate the cause or recommend a good behaviorist. Older cats might stop using the litter box either because of stress or a medical problem.